Your report will be emailed to your PayPal email address within 2 business days of purchase. Pay using direct transfer: email office@newpower.info for details or to request an invoice. 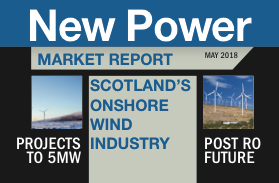 New Power is designed for any organisation with a financial or policy interest in the UK energy industry. Investors, utilities, consultants, major suppliers and contractors, developers, policymakers and any company providing specialist services to the industry will find it excellent value for money.